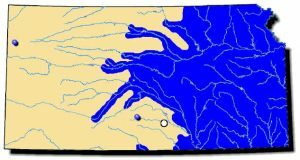 Distribution includes the entire Mississippi River drainage; various localities in the St. Lawrence basin; the Red River of the North; southwest into eastern Texas; and southeast to Louisiana. In Canada, it found in the Assiniboine, Bloodvein, Red and the Roseau Rivers in Manitoba and Lake St. Clair and western Lake Erie and tributaries including the Sydenham, Ausable, Grand, Thames Rivers in Ontario. The species is secure throughout its range with some declines in the Canadian portions recently. Comments: The mapleleaf shell’s shape resembles its namesake. A noticeable ridge, with an adjacent valley (finger groove), is consistently apparent in the external shell structure. This groove, or sulcus, is often bordered by a row of pustules lining each ridge. 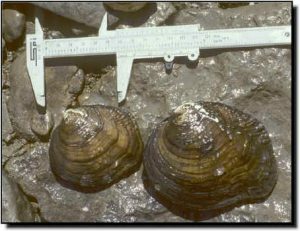 This mussel species has the most shell variability across its wide geographical range in North America, creating taxonomic struggles. It is unique in having the flathead catfish as its only known fish host. Without this fish present, the mapleleaf would eventually disappear. Because host fish can gain immunity from past glochidia infestations, it is necessary that young flathead catfish be produced each year to be suitable candidates to host mapleleaf glochidia. The mapleleaf is found in a wide array of habitats including small sandy streams in western Kansas, backwater pools within larger rivers and even large reservoirs. This suggests it is a generalist species and more tolerant of pollution than other mussels.